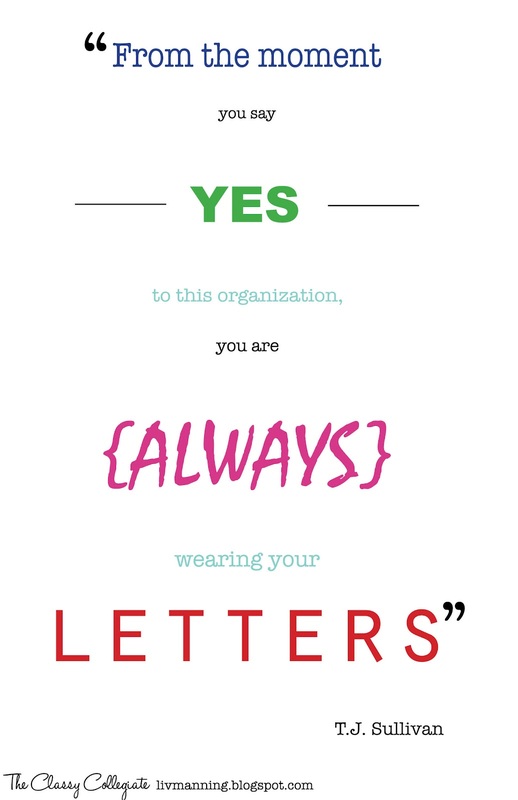 If you are a member of a sorority or fraternity, you understand how important this statement is. It comes from a blog post written by T.J. Sullivan (which you can find here). Now, I believe this post is phrased exactly right, I could never find something to change about it. If you wish to join an organization, not necessarily a greek one, you must remember that no matter what you do, no matter where you go, you represent that organization. It doesn’t matter if you are wearing your t-shirt, pin, ring, whatever distinguishes you as a member of the group, you always represent that. But I feel the underlying message in both of these is, quite simply, be true to yourself and your values. I firmly believe that having good values and always sticking to them will carry you through life.